Let me tell you a little secret. The time of day you schedule activities such as lessons or sports really does matter. The time of day will have a huge impact on your child’s enjoyment and ability to participate well as well as the flow of the family at home and how stressful this added activity is or isn’t to the family. My husband always tells me there is no way we would be able to have the kids do what they do without my planning ability. 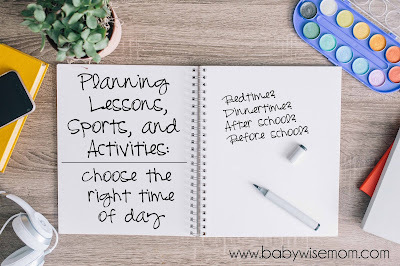 I want to share some things I do to make sure the kids can do their activities without it taking over every single minute. If you are a person who has a consistent bedtime for your kids, you do not want a time that is too late. Kaitlyn once had a dance class that got over during bedtime when she was in first grade. It was the only time offered at the studio. I really should have just went to a different studio (hindsight). She was too young to handle being up late. She did not like dance at all that year. A huge part was the teacher, but a little part was also that she was just tired there. This year, her dance class is again at bedtime (different studio). However, she is now old enough that it isn’t a problem for her. If I had to take all of my kids along with me, I wouldn’t have stayed at the studio, but the other kids can be at home getting ready for bed so it works out. If you have a younger child, like I do with three year old Brinley, make sure you avoid scheduling things right around nap time. I did her dance class at 10 am so that she is fresh and happy. Any time your child is doing an activity during dinner, you need to be very aware and make accommodations for this. You either need to have a good snack before the activity or move dinner up that day so your child can eat before the activity. This happens for us often during soccer season. A game will be during dinner and the child will run out of steam fast because it is dinner time. Instead of eating, the child is expending energy. Be sure your child’s free play each day is not taken up with organized activities. Free play is very important for children. My husband works right next door to the gym where McKenna takes gymnastics and this year cheer. I always schedule her gymnastics class so she is ending right when my husband gets off work. This way I just drop her off and come home. My husband picks her up on his way home from work. Then I am home making dinner so when they get home, we are ready to eat. Try to think of when you could plan things for when your spouse, a grandparent, an aunt, or yourself is already in the area to help with drop-off or pickups. For any activity where it is a practice type of situation, I like to try to plan things as overlapping as possible. It might make sense at first glance to keep things one after the other, but I like them to be at right about the same time (assuming I can get each kid there in time). That way we are all busy at the same time and we can all be together as a family at the same time. My favorite time of day for activities is right after school before my husband is home from work. That is time our family isn’t all together anyway, so any time I can get those activities in before he is home, I do it. This year we are trying something new. We are doing our piano lessons before school rather than after school. I have always done piano right after school. We are able to get them done by the time my husband gets home, so it fits that criteria. However, it was something that interfered with a day when they could just come home from school and have free time. In an effort to have more free play during the week, we decided to try piano lessons before school. So far, it has worked well. Our school doesn’t start until 9 am, so with a 7 am wakeup time, we have plenty of time to work this in. The downside is instead of one day of piano, we have two, but that has been okay. I scheduled the lesson to start so my husband drops Brayden or McKenna off on his way to work. So I am utilizing the advice for already being in the area. Then I pick up Brayden and drop off Kaitlyn. We then pick Kaitlyn up on the way to school–again, already in the area. I am already driving my kids to school each morning, we just take a little pit stop this day. This year, McKenna is taking gymnastics at the same time as kids in two different families in my approximate neighborhood. We take turns and drive just every 3 weeks. This is a fantastic way to go about activities. It doesn’t impact our family as strongly when she is driving with someone else. I am able to give my time and attention at home. Not all activity times can be chosen. This is what makes seasonal sports more stressful–you can’t control game times and if you have more than one child playing, you can have games at the same time in two different cities. That is especially why it is helpful to be wise in any activity you do have control over. That makes the others more doable. What Age Should Children Start Activities?